30 minutes to get to the start line in Indy? That would drive me crazy! So far, the LIMA 5k has the BEST swag after the race! Tons of Pure Protein bars (YUM! ), fruit, bagels and even pizza (not for me post-race!)! Love your Q and A Sundays! 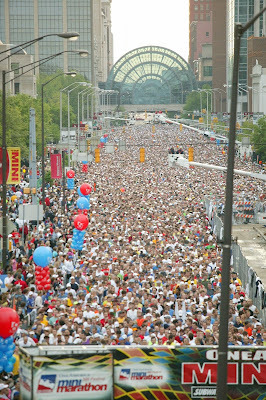 That picture of the starting line at Indy is crazy! Just having done my first 5k yesterday it was great to read your comments on it. I was EXTREMELY nervous for it all week. Now that it's done there was no need to be. But I know when I do another one I'll be nervous then too. I really love these Q and A's, I always look forward to them! I think I might be a recent addict to running! I ran again today and beat my time by 3 minutes!! YAY! That was so me 10 days ago! 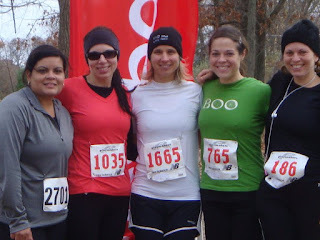 I did my first 5K on March 10. Katie's experiences pretty much match my own. I put myself right in front of the walkers. I am very slow but finished without walking or stopping in 43.12. I ended up being #136 out of 188, which I thought was pretty good. It was nice to know that there were lots of people behind me, even if most were walkers. And in our race, they had people posted every mile (and every 0.25 miles at the end...the end was a confusing route so they had a lot of people to show you where to go) and all of them were so encouraging, telling me that I was almost done, or that I had a good pace, etc. And crossing the finish was amazing!!! My family was waiting for me and it was the best feeling ever. I'm currently 70 lbs overweight. That crowd in Indy is something!! I would be afraid of getting mowed over. LOL. The 12k I have walked the last several years has a staggered start. We get separated by colors according to speed and they start the fastest ones first and then get it going to the walkers/strollers. Definitely irritating to get run over by the people pushing strollers who are supposed to be walking however. Is there any chance you know about the mile fun runs? Are they divided in the same way? 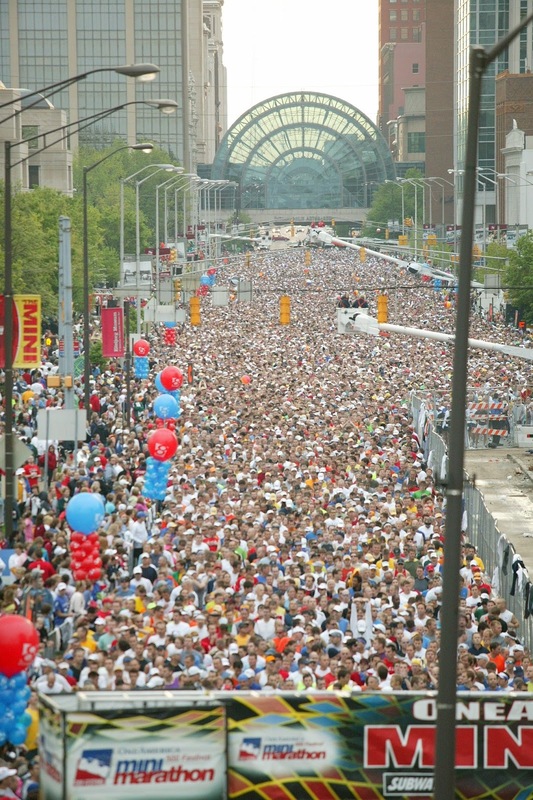 Does anyone ever walk the fun runs? I emailed you before about running with my son, and the reply was very helpful. We are signing up to do a fun run at the end of April. It's 15 dollars and we get t-shirts and baseball tickets also! I'm just not sure he will be ready to run a full mile by then with his little legs, although we just started "training" with the nice weather, and we are improving every day. The fun runs are meant to be just that--for fun. You can walk, run, skip, or crawl, whatever you'd like! I think it's a great confidence booster for kids when they see that they just completed a whole mile (and they might get a t-shirt or medal for it). But I've seen older people do it (without kids), and I think that's great too! Thank you so much for taking the time to answer all these questions! I can't wait to do it. I just didn't want us to be the only people walking, if that were to happen. I'm going to pass this along to the Mr. 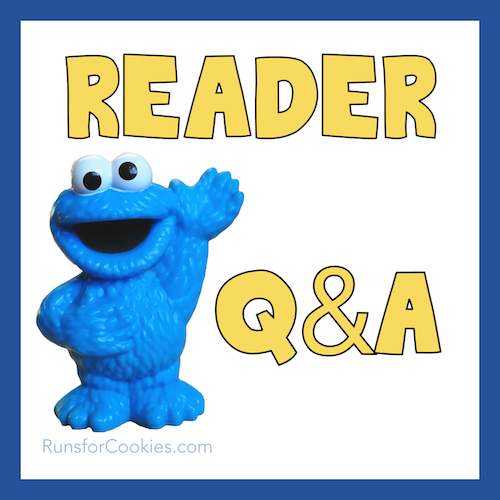 He flip flops about whether he's going to run a 5K or not and I'm sure this post could help him know what to expect. Thanks! I really need to find someone to run long runs with - the boredom is really the worst part for me when it comes to runs of more than an hour or so!